The Amazon CEO, Jeff Bezos, has accused the owner of the National Enquirer of "extortion and blackmail", alleging that lawyers for David Pecker threatened the tabloid would publish text messages and intimate images if Bezos didn't halt an investigation into how it had obtained those files. Bezos, who is the world richest man and also owns the Washington Post, became the subject of tabloid fodder in January after he and his wife MacKenzie announced they were divorcing. Shortly after, the National Enquirer published "intimate text messages" revealing Bezos' relationship with Lauren Sanchez, a former tv anchor. After the tabloid published his personal messages, Bezos retained private security consultant Gavin de Becker "to determine the motives for the many unusual actions taken by the Enquirer", he revealed in his blogpost. Jeff Bezos' private investigator suspects the Amazon CEO's leaked text messages with his lover Lauren Sanchez may have been acquired by a 'government entity'. Bezos believes that reasons behind the National Enquirer outing his affair were 'politically motivated', and has hinted at the magazine owner David Pecker's ties with Saudi Arabia. All of us should be aware of Israel's meddling in the internal political affairs of the U.S. as their most important benefactor. My perception has been for a long time the Israeli PM is the master and U.S. politicias are the puppets. I am convinced Bibi Netanyahu has played a crucial role behind the scenes to get a Republican candidate elected at a cost to the candidate of the Democrats to the detriment of the American people and beyond. A pact designed by devilish evil which was aligned with the self-interest of Russia's Putin. Costly for him, all the blame has been put at his doorstep ... the 21st century boogeyman or our enemy #1. The leaked messages could be from any intelligence source or a combination - GCHQ-NSA-Mossad-BlackCube - the deep state working beyond the oversight of government and parliament. The tabloid publisher took along a special guest, Kacy Grine, a French businessman who advises one of Saudi Arabia's richest men [Prince Al-Waleed bin Talal - Oui] and sometimes acts as an intermediary between Saudi Crown Prince Mohammed bin Salman and Western businesses. 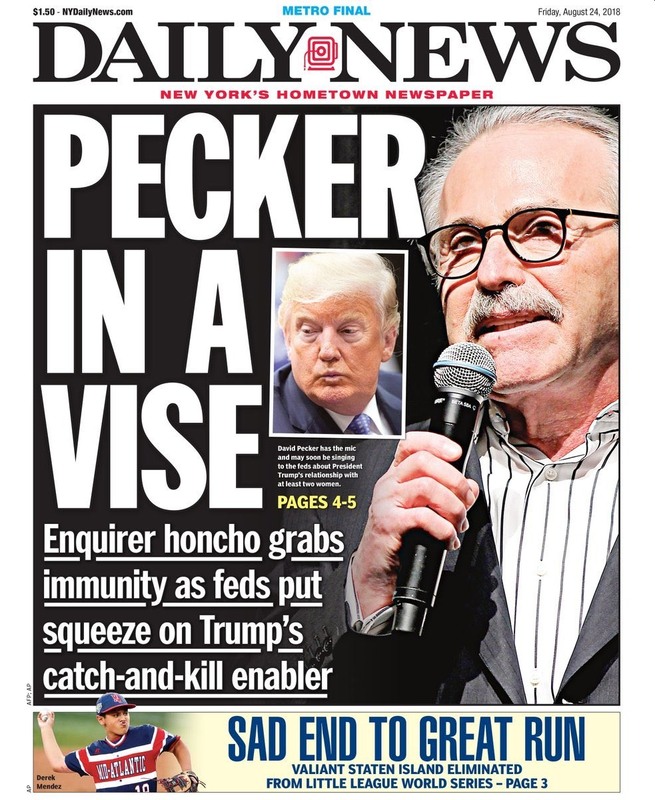 The two men and other Pecker associates chatted with the president in the Oval Office and briefly met with Mr. Trump's son-in-law and Middle East envoy, Jared Kushner. Mr. Pecker's company, American Media Inc., published a glossy magazine that is essentially a promotional brochure for Saudi Arabia and the crown prince. Remind Peckerhead that squillionaires have their own version of the LeStat the Vampire Rule: Never Prey on your Own Kind. If the reminder doesn't work, recruit other squillionaires to circle the wagons and apply economic pressure to bring this rogue to heel. If that doesn't work, it may be time for the former intelligence people who are now freelancing for you to arrange for Peckerhead to have a tragic private jet accident somewhere over the Caribbean.